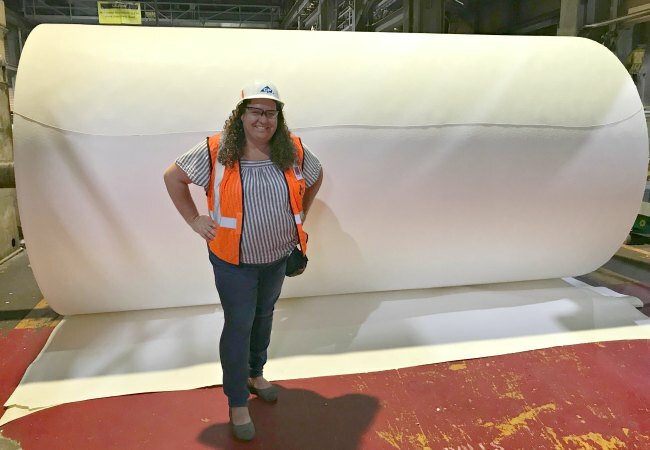 Georgia-Pacific invited me to visit their Foley Cellulose Mill in Perry, Florida. 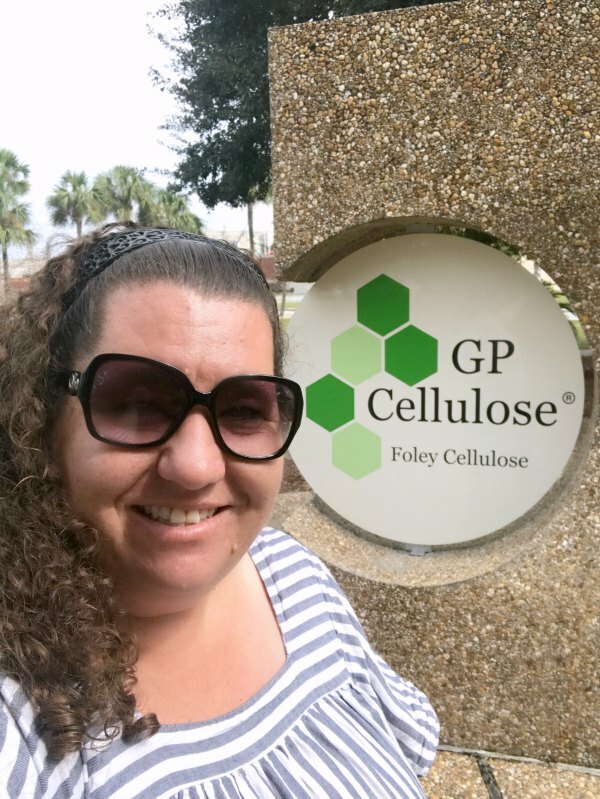 I’m excited to share with you the many ways that they are making an impact in our communities, in our environment and through their various quality products, which includes cellulose. It was amazing to see how a large corporation focuses on producing everyday quality products. Georgia-Pacific makes brands that we all know and trust, from paper towels, toilet paper, plates and cups, to lumber and boxes. Next time you’re at the store look for their brands such as Angel Soft, Brawny, Quilted Northern, Sparkle, Dixie, Vanity Fair, Mardi Gras and STAINMASTER. 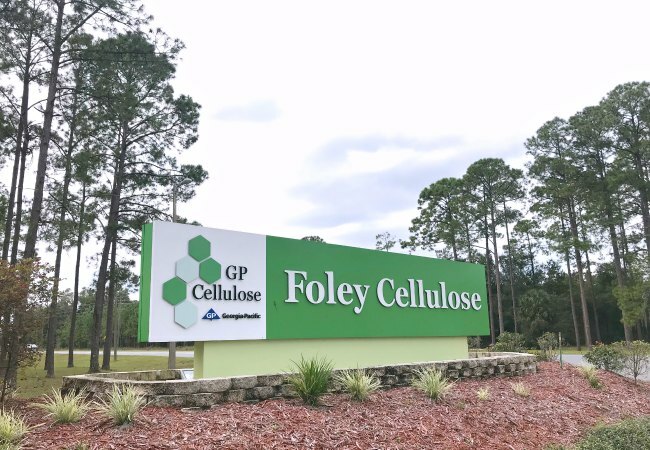 One thing I learned about quickly during our visit at the Foley Cellulose Mill is that they also make cellulose, which is not a word I really knew about before. While you won’t see the cellulose made at the Foley mill on the shelf, cellulose does go into so many of the products that we use and consume every day that you can find in a store. Cellulose is used in everything from food items such as hot dog casings, shredded cheese and even ice cream. Additional uses of cellulose in the fluff form are used for absorbency in feminine and incontinence products and diapers. 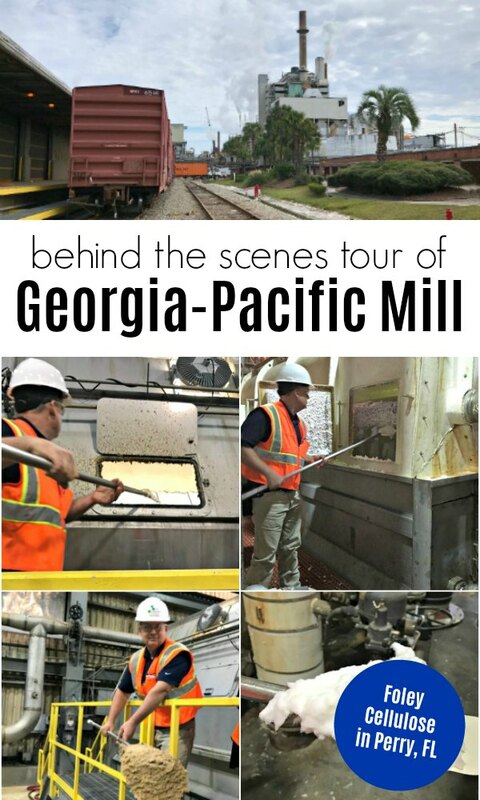 Georgia-Pacific has four mills that make cellulose in the United States, and they ship it to manufacturers here and to other countries as well. 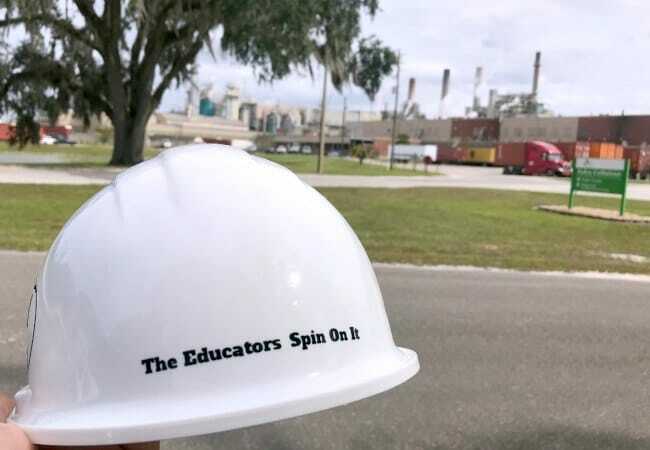 Here’s my customized hard hat that they made for me to tour the Foley Cellulose Mill in this picture above. Confession time, I love seeing the engineering and science behind manufacturing items and going on tours. This mill tour was packed full of information that I hope to share with you. 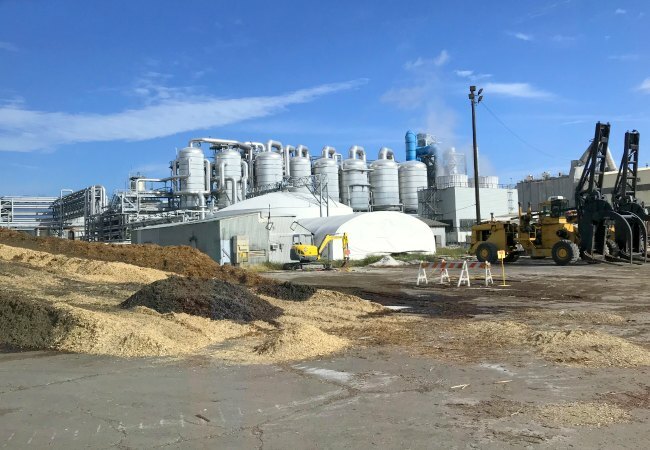 If you go visit Georgia-Pacific’s website for its cellulose business you’ll see a little more information about the use of cellulose in our everyday lives and the importance of it. 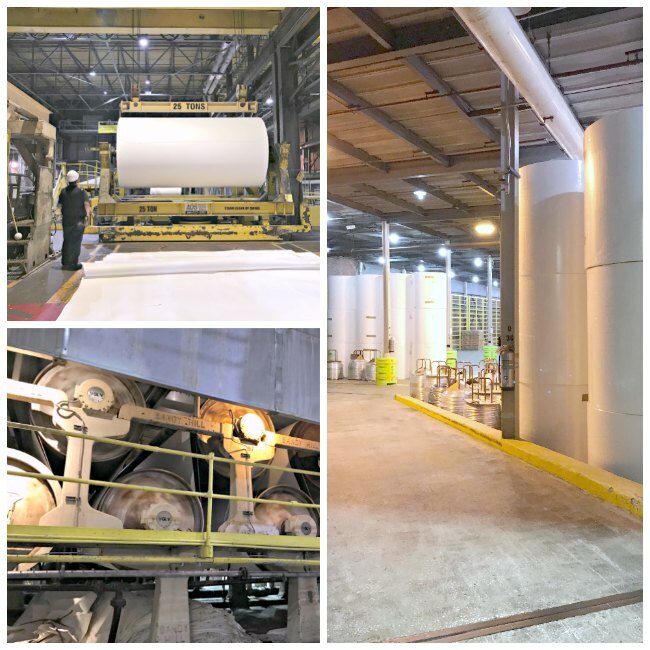 It was such a fascinating experience to tour the Foley Cellulose Mill from beginning to end. Our mill tour started by watching trucks bring in the pine trees which are then cut into chips. 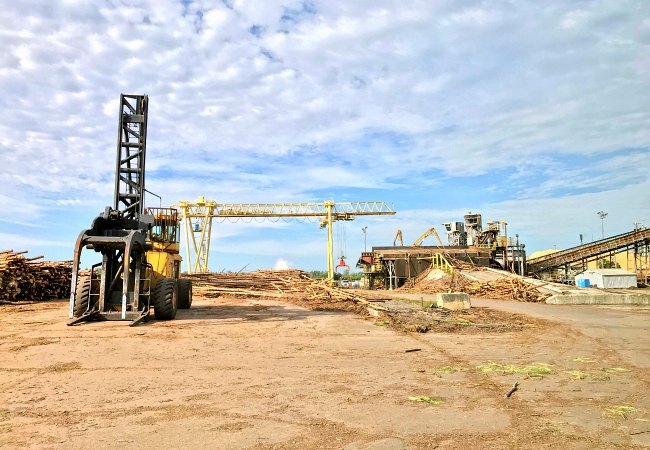 This large piece of equipment takes the wood bundles from the trucks. 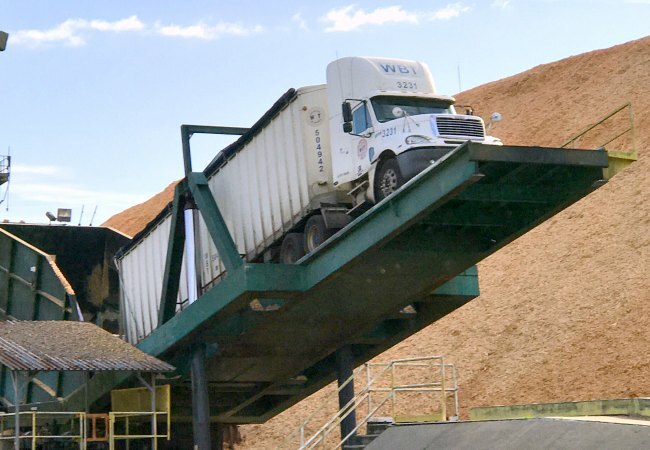 Who knew there were machines able to pick up an entire semi-truck to remove wood chips from a truck? FUN FACT: Once a tree is cut a new tree is planted, it takes about 20 years for that tree to grow and be harvested for these products. It’s surreal to think that the trees being planted today will become paper or cellulose by the time our children are adults. Georgia-Pacific makes sure the trees it uses are harvested responsibly from sustainable forests and they even certify the process through the Sustainable Forestry Initiative (SFI) Fiber Sourcing Standard. Having brands that practice sustainability is important. Here they take the wood chips and put them through a 2.5-hour cooking process. What’s left is pulp, which goes through a cleaning process. 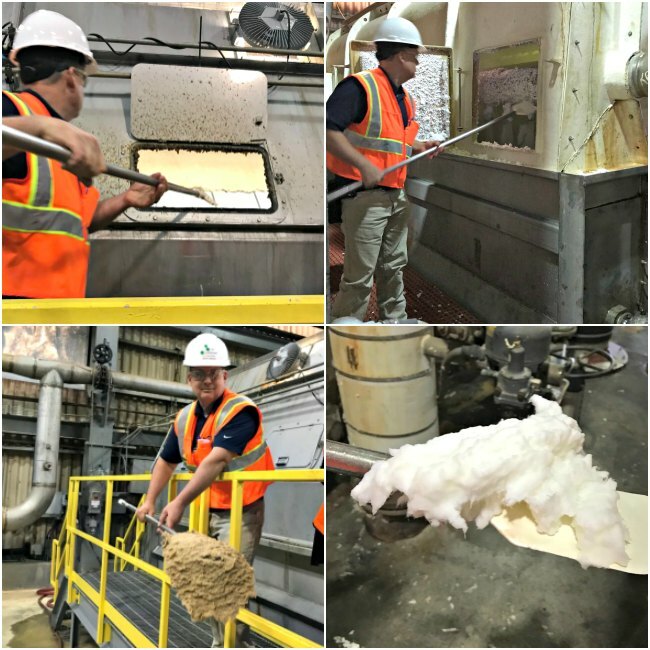 The last step at the Foley Cellulose Mill is to take the clean pulp and make it into cellulose sheets which they roll up and ship out. The mill makes both huge rolls like this and quarter sized ones, depending on the manufacturer and what they’ve ordered from Georgia-Pacific. The large rolls are too heavy to fly, so they have to ship them on trains or in semi-trucks. It was really interesting to see how that process happens and the safety industry standards that are in place to keep their valued employees safe in order to make a quality product. During our tour they pointed out the mill’s new black liquor evaporators which evaporate water vapor from byproducts of the pulping process. They use the most up-to-date technology which helps the mill be more energy efficient and reduce its groundwater use. Just so you get an idea, this upgrade was a $84 million project to help the mill be more efficient and lessen the environmental impact in how they operate every day. The new system allows for nearly 40 percent improvement in steam economy, which is how the mill generates its energy. The mill produces 85% of its own energy. Technology has advanced so much over the years and it’s good to see how a company like Georgia-Pacific is using the latest equipment at their mills. As I toured the mill, I could see how much water is an integral part of their system for what they make, and how they want to make as little an impact on our environment as possible. After we learned about the Foley Cellulose Mill, a few staff members from Georgia-Pacific took us down to the Fenholloway River to learn about the area surrounding the mill. We went on a boat tour of the final 2 miles of this estuary before you get to the Gulf of Mexico. They have been working for several years on a project to improve this local waterway that used to be an industrial river. 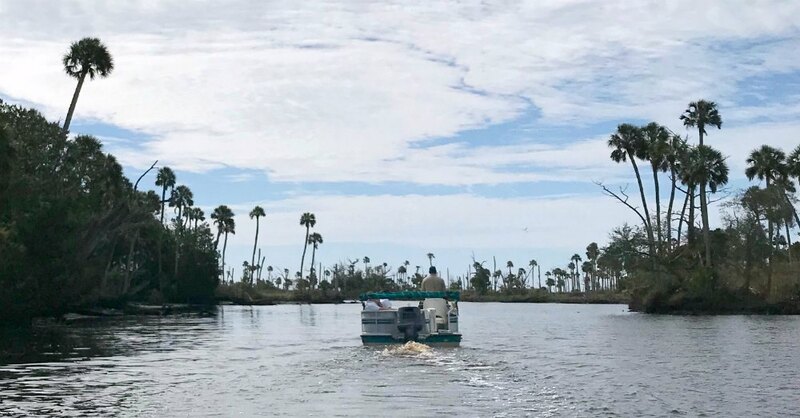 Their efforts are helping to restore the river back to its natural ecosystem, which includes the seagrasses and improvements in water quality so it’s fishable and swimmable again. This tour allowed us to see what that environment looks like. 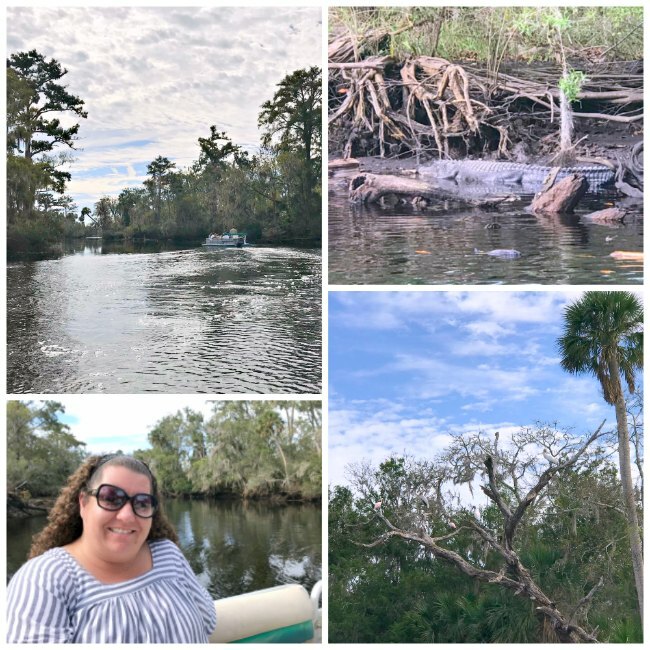 During our gorgeous boat ride on the Fenholloway River there were alligators, turtles, fish and a variety of birds flying around. It was neat to see the wildlife there that they’re working hard to keep protected, putting their focus on their local community to create a thriving environment. The mill is also working with Taylor County to make a new recreation facility with picnic tables, restrooms and a boat dock. When it’s finished, it will be a fun place to head out to and enjoy this recreational area. If you’re ever in the area, I’d suggest grabbing a bite for lunch at the favorite local spot, Deal’s Famous Oyster House. Our lunch there was amazing! Georgia-Pacific is making a long-term investment to support the quality of the local environment. Here’s more info about the Fenholloway Water Quality Project. Click here! Georgia-Pacific Foley Cellulose Mill operates 24 X 7 which means they are open 365 days a year. They work for four shifts in order to keep that happening. 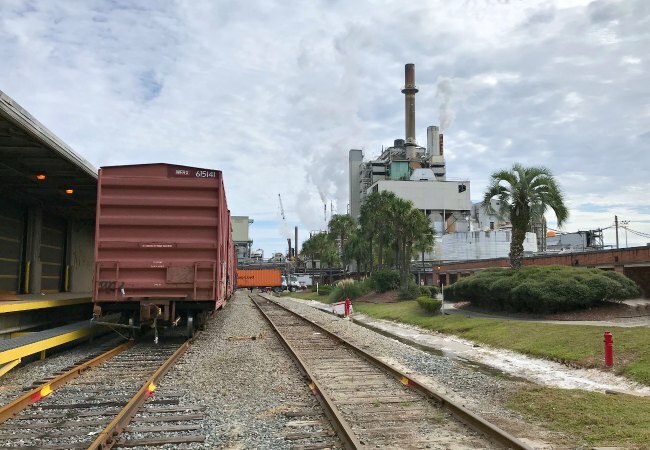 For the North Florida community this Georgia-Pacific Mill employs over 500 employees and 200 contractors. You can clearly see that they are an integral part of this community, from supporting educational programs to on the job training programs. I was impressed by the efforts that Georgia-Pacific gives to not only manufacture high quality products for our families but also as a company that is educationally focused, eco-conscious and works to provide employment opportunities in North Florida. As you’re out and about, look for that GP logo and know that this is a brand that is invested in our tomorrow with our children.